The 10th anniversary of the Great Recession, a.k.a. the Great Financial Crisis of 2007-08, has inspired a spate of comments across the globe. Almost without exception, they warn that the lessons of that financial crisis have not been absorbed, and another giant financial bubble is currently inflating its way to another huge bust. Yet, this near-unanimous chorus of warnings has not stopped stock markets across the world from reaching new heights. Greed is drowning out fear.Many busts are caused by central banks tightening money . Today , we have the opposite: the greatest flood of money ever created (over $10 trillion, according to some estimates). The central banks of the US, China, Europe, Japan and Britain are at the forefront. What happens when these central banks try to return to normal, and the giant flood becomes giant ebb? Optimists claim that central banks can manage the transition smoothly .The US Fed plans to move in baby steps, announcing its intentions well in advance to avoid panic. This assumes that markets are rational, when they are mainly creatures of panic and euphoria, boom and bust. Much has been written about the printing of trillions of dollars by the US Fed after 2008. But the others are not far behind. A recent Financial Times column noted that the Bank of England, created in 1694, had a bank rate of around 4% through most of its history . This fell to 2% in the Great Depression, then rose and peaked at 17% in the inflationary 1970s, before returning to the historical 4%. After 2008, an unprecedented monetary stimulus has reduced the Bank rate to 0.25% today . The Bank has also bought £445 billion (about ` . 36,900 billion) worth of securities by printing money . This enormous stimulus has neither led to a boom in GDP nor in consumer prices. Instead, like stimuli in other countries, it has created a giant bubble in assets like bonds, equities and real estate. Many financial analysts fear that the next bust may come not from Western central bank action but from China. This country encouraged a lending boom to rescue the economy after 2008. But that now seems out of control. China’s debt has exploded from $6 trillion to $28 trillion, and its ratio to GDP is up from 140% to 260%. James Anderlini of the Financial Times (`China’s economy is addicted to debt’, goo.glMcRV96) says this has created “an economy addicted to borrowing and afflicted with serious asset bubbles. The ultimate test will come when Beijing eventually attempts to wean the country off this debt dependence.“ Historically , bonds and equities have moved in opposite directions. Today , both are at all-time highs. Not because this makes economic sense, but because the tidal wave of central bank money has to be put somewhe re. So, financiers are plunging into bonds and equities simultaneously , as in the bad old days of 2003-08. They are also plunging into junk bonds, and even junk countries. Argentina has repeatedly defaulted on its foreign debts in the last 100 years. Yet, in the current financial madness, it has successfully sold 100-year bonds, a privilege once restricted to the most creditworthy nations. Mohammed El-Arian, chief economic adviser of Allianz, complains of a “liquidity delusion“ that cheap money will continue to flood in forever. So, there is too much risk in soaring markets. 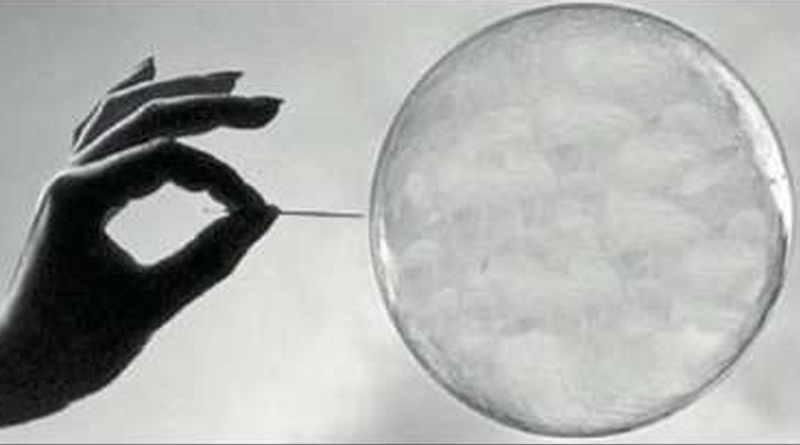 Such a huge bubble typically occurs when three things happen simultaneously . One, the arrival of an exciting new `disruptive’ technology that is difficult to value in the short term, but has huge potential. The second is easy market liquidity to help investors roar into markets. The third is cheap credit. Many hyped companies (now called `unicorns’) have never made a profit. Yet, investors have thrown huge sums at them, raising their valuations above $1 billion each. The world now has over 260 unicorns, including many in India. A bust is certain everywhere (including India). But nobody knows when. The 2003-08 boom proved that markets could soar for years after being declared irrationally exuberant.Cynics are still buying, hoping to double their money before the bubble bursts. It’s a risky strategy.